The Market and Octavia area plan anticipates thousands of new housing units being developed in the Upper Market area over the next several years. Yet, our public transportation infrastructure frequently fails to meet even today’s needs. So, do you support requiring appropriate improvements in transit capacity and service before new development entitlements can be granted, and why or why not? It’s complex, but it cuts to the heart of an issue that our city leaders haven’t been good at tackling. Sure, every candidate says they want Muni to be on time, and that it’s about time that happened, but those are easy platitudes. The real pressing question is: How do we pay for improved and expanded transit service? And why, in a Transit First city, are we approving new housing and commercial developments with added capacity for parking without adding transit capacity too? Those are the underlying issues behind the initial question given to 5 of the 10 mayoral candidates who were asked to take part in the forum. None of the candidates who were asked to respond — Michela Alioto-Pier, David Chiu, Tony Hall, Joanna Rees and Leland Yee — addressed it in a substantive way. Chiu came the closest to directly responding, pointing out — to applause — that he is the only mayoral candidate who doesn’t own a car, but his answer was vague. “We need to make sure that our city is investing in appropriate transit infrastructure. I think what’s appropriate is that we are paying as we go. If we are creating development, we need to make sure that there is transit and transit improvements related to that,” said Chiu, who then used the remainder of his time to attack Mayor Ed Lee, like many of the other candidates did, for jumping into the race when he said he wouldn’t. The next mayor needs to figure out how to solve the SFMTA’s structural deficit. If we’re ever going to reach the on-time performance goals in the City Charter and achieve acceptable Muni reliability, quality and crowding standards, the SFMTA has estimated the agency needs to raise an additional $75 to $100 million a year. And that doesn’t cover transit capacity around new development. “What’s very frustrating is that we’re not anywhere near prepared to expand transit capacity. All we’re doing is cutting right now, as a city,” said Jason Henderson, an SF State geography professor who heads up the transportation and planning committee for the Hayes Valley Neighborhood Association. Development impact fees don’t solve the problem on their own, but there are funding ideas aplenty. Just not politically popular ones. SFMTA staff and a variety of revenue committees over the last few years have offered several proposals (some old, some new), and some would require state legislation and take a few years to implement. They include congestion pricing, a transit assessment district, extended parking meter hours, a transportation utility fee, a vehicle impact mitigation fee, and many more. For a detailed list, check out this presentation the SFMTA gave in February [pdf]. Everyone agrees we need better transit service and the city has recognized this for decades under many mayors without a concrete solution. The mayoral candidates need to start talking specifics about how we’re going to fund Muni, and for that matter, how we pay for future pedestrian safety and bikeway improvements, or we’ll never see the kind of Transit First city we deserve. In the coming weeks, we’ll be interviewing the top mayoral candidates on transportation and land use issues, and we’ll put this question to them, pressing for a detailed answer. Oh yay, political ‘debate’ prompted by leading questions from NIMBY-run neighborhood organizations. What could be finer. Note to said neighborhood associations: Some of us like living in the city, are sick of blight, would like to see more infill, and get around just fine by bike and foot. Muni is pathetic, but making development incumbent on its improvement is just another way to mire progress in yards of red tape. Do any of us need that? Not so much. Are there any major cities outside the US which rely on MUNI-like service as primary public transit? Third world, perhaps… Nothing even remotely resembling timely travel. My bike is substantially faster than anything except BART, and that serves only a small slice of the city. We should fairly assess the financial impact of each citizen’s transportation choices on the rest of the city’s residents. Using a private car has certain impacts — from parking to road wear & tear to collisions. Tax and assess fees and parking rates according to true costs, but don’t go over that amount. Car owners currently are paying a lot into the SFMTA, a lot more than anybody else, but we don’t see the connection between fees, fines, and taxes on the one hand and our own real impacts. Make this clear, and I bet car drivers would understand and pay up. As it now stands, we feel like SFMTA’s ATM. Next, see what impact any of us has when we aren’t driving but are moving about as mass transit users, bicyclists, or pedestrians, and assess a tax that would hit everybody — a per capita tax for supporting transit infrastructure (including maintenance, bike lane paint, the buses/trams, etc.). Make up the remainder with use fees (fares) on mass transit. Riding the bus/trolley may help the environment, but it’s still a service to the rider. Currently, fares in no way cover the value of the service delivered to the customer. If every mode of transit had to pay its way and bus fares rose, you would not see an exodus from MUNI to car use. Why? Because car use would also be accurately priced and therefore more expensive than the increased fares on MUNI. I’ll be very favorable towards the candidate(s) who says she will make it a priority to implement the congestion pricing plan for weekday evening, outbound only cars and use that funding (some $60-$80 million per year potentially) to fund capital improvements and better bus service. Ask them point blank about congestion pricing – yes or no – don’t accept “um, well, it depends.” It’s worked elsewhere, and the only thing from preventing it work here is politics. It’s easy to say something that makes activists happy, only to then go and say something else to the NIMBYs in private. Talk is cheap. Doing something is more difficult. I’m going to reboot the Muni Rider Voter Guide to try and cut through the crap a little, hopefully. So many of these folks have a lousy record on Muni/transit/bike issues, I’m not optimistic. Even St. Ed doesn’t give a crap about it. This question goes to the heart of SF’s delusional “Smart Growth,” dense development approach to planning. There’s no free lunch on traffic and parking. Wonder why Muni is inadequate and underfunded? Because these same candidates support the Central Subway ($100 million in city transportation money) and the Taj Mahal-like terminal downtown (another $100 million in city transportation money). The city is wasting all this money even as Muni is chronically underfunded and, to top it off, City Hall is putting a $248 million bond on the ballot just to pave city streets! Borrowing money for operational expenses! The city that knows how—to squander taxpayers’ money! 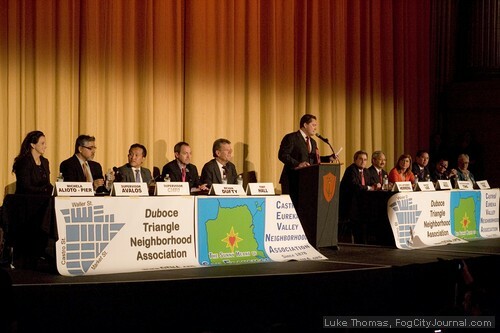 SFBC Releases Mayoral Candidates Q&A: Who Will Be the Favorites?